Do you want a travel system that is high-quality, durable, safe, multi-functional and doesn’t cost a fortune? I’ve got something just for you: Evenflo Pivot Modular Travel System. Find out why this stroller is so awesome and loved by so many parents! When I saw this stroller for the first time and I found out it costs less than $300 I was really excited and I knew I had to try it! I wanted to check if it only looks so awesome or if it’s high-quality and multi-tasking as well. Recently this stroller gets more and more popular and many parents are thinking about buying it. I decided to test it and review in details to answer the question: Is Evenflo Pivot Modular Travel System worth buying? Psst! Did you know that there is a new version of this stroller that expands to a double mode? Here’s my sneak peak on the brand new Evenflo Pivot Xpand Modular! This is a 3-in-1 stroller that really grows with the baby. This travel system will definitely serve you for few years – from infancy till toddlerhood. Evenflo Pivot Modular Travel System offers six different seating modes. Parents can push it with an infant car seat or toddler seat, or convert the toddler seat to bassinet. In each seating option baby can ride facing parent or the World. 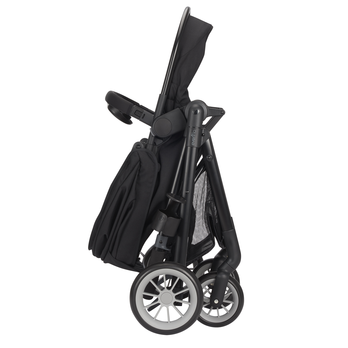 Check out the picture below – each part of this stroller looks so elegant and stylish! Let’s start with the option for newborn baby – infant car seat. SafeMax Infant Car Seat is suitable for babies from 4 to 35 lbs. When we install it in the car in the SafeZone Base it is rear-facing. The base absorbs and dissipate energy during a crash through anti-rebound bar. This anti-rebound bar is awesome safety feature, because it also prevents forward motion in the event of a collisions. Huge advantage! This car seat has passed many safety tests above norms and standards! It’s easy to install the car seat into the base in the car. And just by one click parents can remove the car seat from the base and transfer it to the stroller frame. If you want to stroll with the infant car seat you just simply snap it in the frame, front or rear facing. You don’t need any adapter which is really convenient and useful because you can quickly switch between car and stroller without waking the baby. It’s a handy feature when you have to run some quick errands in the city or go to the store. 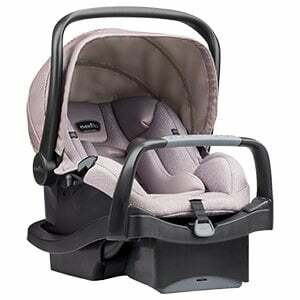 SafeMax Infant Car Seat has full canopy and there is an additional cushion for head and back support. It increases infant’s comfort and provides more safety ride. This newborn insert can be removed as the baby gets older. The car seat is nicely padded with soft fabric which is proper for newborn’s delicate skin. The harness straps can be adjusted by rethreading, as the baby grows. This infant car seat is also very lightweight (about 8 lbs) so parents can easily carry it by holding an ergonomic handle. Even when we add baby’s weight, it’s super easy to lift. SafeMax Infant Car Seat can be also bought separately. You can find more information about SafeMax here. For longer walks we can turn this stroller into carriage mode. You’re probably wondering how to do it, since there is no additional piece of gear like a bassinet in the set. Well, the toddler seat can be easily converted to a bassinet within few second. If you have the seat removed from the frame, you just need to flip it over and there is a buckle on the bottom which you need to unfasten. Then pull out the strap that is hanging on the back of the seat to recline it fully. Then just click the seat into the frame, recline it all the way down and voila, you have a stroller with bassinet. 🙂 You can also do this while the seat is attached to the frame. In the carriage mode canopy covers most of the baby. I think bassinet is the best way to stroll with newborns and infants who don’t have head and neck control yet.I love that the seat features fully recline and can be converted to carriage. It’s 2-in-1 which means we can save space in house, because there is less baby gear to store. This bassinet can be used only when it’s attached to the stroller, because if we take it off it will collapse. So we can’t use it for sleeping in the house, unless it’s snapped into the frame. When the baby can sit unassisted and has neck and head control, you can start using the toddler seat without converting it to carriage. The seat is very easy to lift and recline. In the toddler mode there are two different ways to adjust the seat position: lower or lift the whole seat or just recline the back rest by using a strap. In this mode the seat can also go all the way down so your toddler can comfortably nap during strolling. Fully recline is also very useful for changing a diaper. This seat is equipped with very convenient belly bar which your child can hold on to or you can use it as a handle. There is also removable child tray that clicks into the bumper bar. You can put there some snack and a sippy cup for your little one. The belly bar and child tray can be easily removed just by clicking two buttons. Bumper bar doesn’t swing away but removing it is a piece of cake. 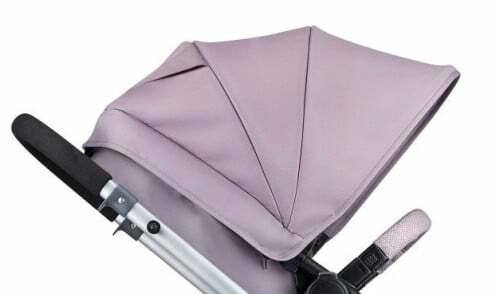 It’s a big advantage that a child tray is included, because it is very rare that this accessory comes with the stroller. What I also like is that the footrest has rubberised fabric which can be cleaned seamlessly. Sometimes the child sits in the stroller with wet shoes or shoes covered with mud, but we don’t have to worry that the material will be destroyed. We can easily clean it with wet cloth. There is an adjustable 5-point harness to secure the baby during riding. Moreover, the seat is reversible. The baby can ride facing the World and watch the surroundings but we don’t have to worry about not seeing the baby, thanks to good-sized peek-a-boo window in the canopy. Toddler seat is suitable up to 50 lbs, it fits 2 – 2.5-year-old baby comfortably. From the bottom of the seat to the canopy there is 23”, the seat is 12” wide. Nowadays many parents buy travel systems as a primary stroller. No wonder! When you buy a stroller and matching infant car seat – like Evenflo Travel System, you don’t have to worry about adapters and of course the price is often more affordable. I am a big fan of travel systems, because thanks to them parents can have a stroller that will serve them from day one till their baby can walk and doesn’t want to ride in a stroller anymore. Besides, when you buy a travel system you have less baby gear to store and less baby gear means saved space at home and saved money! And as we all know new parents’ budget is often pretty tight when we consider how much baby products they need to purchase for their new baby. 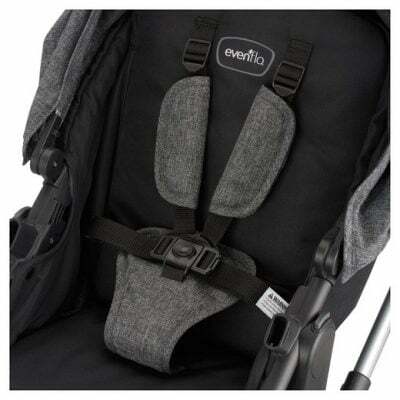 No wonder this comfy, safe and cheap travel system from Evenflo is so popular! 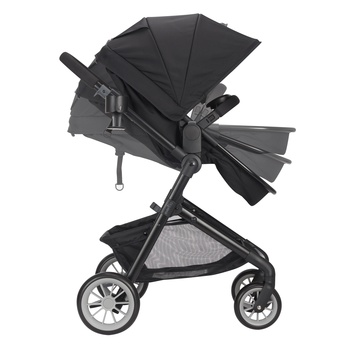 Evenflo Pivot Modular Travel System features large, 3-panel canopy that provides full coverage from sun rays. Your little one can lie or sit comfortably and enjoy summer strolls. There is also good-sized mesh peek-a-boo window which gives extra air-flow. It’s easy to see through the fabric. There is no Velcro or magnetic closure, the fabric just lies and covers the peek-a-boo window. It’s actually great because it’s silent and you can spy on your little one without waking him/her. Thanks to this large canopy with proper ventilation your baby is protected from sunburns and overheating at the same time. This stroller has two bigger rear wheels and two smaller front ones with Cruiser Tires. Thanks to them you can push the stroller effortlessly while your baby is having a smooth ride. And you don’t have to worry about having flat tire! 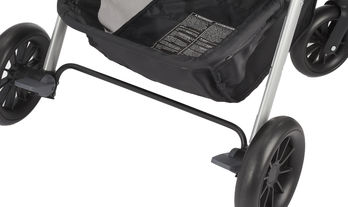 Front wheels swivel and you can’t lock them, that’s why this stroller is not all-terrain. This stroller has double action brakes, places next to the rear wheels. We have to lock each wheel independently. It’s not too much of a hustle, however I’d wish there was a single action brake. What’s the most important, the brakes are easy to press and lift, even while wearing high heels or sandals. Evenflo Pivot has ergonomic handlebar with fixed height at 40” from the ground. I’m rather short person and pushing this stroller is very convenient for me. The stroller has excellent shape and construction. Thanks to it my hubby who is over 6 feet tall also didn’t have any problems with pushing the stroller and what’s the most important he wasn’t kicking the back of the stroller (which is a common issue when the handlebar is not adjustable). However, for very tall parents (like 6’4” and higher) the handlebar may be to short. Evenflo Pivot Modular Travel System offers plenty of storage space thanks to large basket under the seat. It can accommodate our essentials and all of the necessary baby gear. I could easily fit there my bag and a large diaper bag! This stroller works fantastic for going to the mall and day trips. The basket is easily accessible from the back and front. 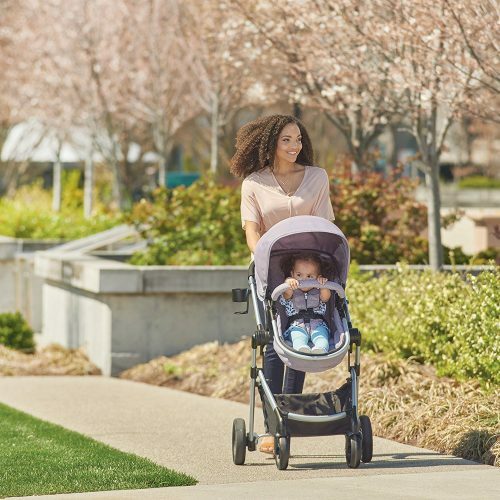 Evenflo Pivot Modular Stroller weighs only 20 lbs which is really nice for a full-sized stroller. We can quickly and easily fold it, it takes about 5 seconds. The are two levers on both sides of the handlebar, we need to lift them and stroller folds down. And there’s no need to bend over! Great for parents with back problems. After folding we can lock the stroller by pressing a button and then the stroller will stand on its own and remain closed. It has very slim profile which make it easy to storage in a closet and transport even in a small car trunk. I’m pretty sure this was the easiest setup of all strollers I have tested. I was like “wow, that was a piece of cake”. It took me only few minutes to attach the wheels, handlebar and the seat and I was ready for a walk with my baby. Everything was very intuitive and simple. This travel system comes with few accessories. There’s removable child tray which can be snapped in the belly bar. There’s also a parent cup holder included in the set which clicks onto the side of the frame. Both accessories are easy to install and remove. When I recently checked on Amazon there was huge discount on Pivot Travel System and its price was even lower. Here you can check if the sale is still on. There are five different color versions: Casual Grey, Sandstone, Aspen Skies, Manchester Tan, Rockland. You can find more information about currently available colors here. I always check other parents reviews before buying anything for my kids, to be sure it meets my needs. And every time I’m checking the Evenflo Travel System on Amazon it is more and more popular! At the moment I’m writing this, it has over 60 reviews (and almost only positive ones!). 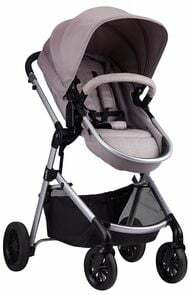 Parents praise it for lightweight and sturdy construction, sleek look of a high-end stroller, easy assembling, safety features, smooth maneuverability and reasonable price. Parents also like how easy is the seat to recline. Some parents mention that this stroller may be hard to push because the front wheels sometimes get stuck. Read more reviews written by other parents and find out what they think about this travel system. This is not an all-terrain stroller, although it handles many types of surfaces, it works best in the city: on pavements, asphalt and even gravel routes. Thanks to convertible seat that transforms into bassinet, you have two seating options but only one piece of gear to store! This stroller offers so many features like a high-end products and comes with extra accessories. You probably might think it has to cost a fortune, but the price is really pocket-friendly. For a price under $300 we get a really awesome baby travel system for everyday use and some great accessories for more convenient usage. 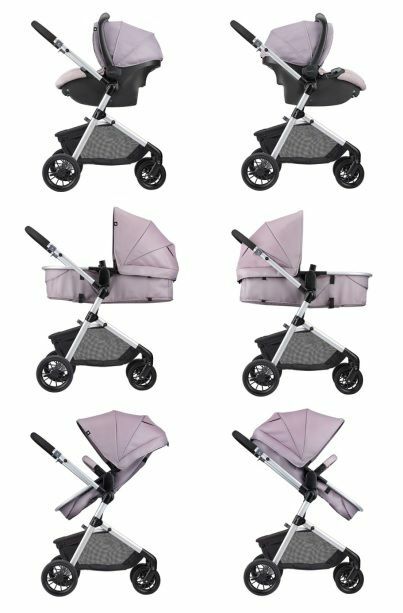 Do you like Evenflo Pivot Modular Travel System? 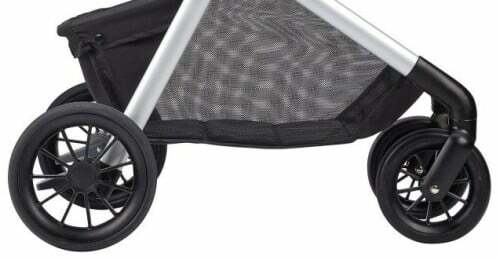 Before you buy it, check other parents reviews here and make sure this stroller suits your style. Hi! Is the sandstone color more like a grey-ish color or more like a light tan/beige color? There are so many different pictures and filters that I am unable to tell. Thank you for your help! Hi! How old does the baby need to be to remove the extra pad in the car seat? Thanks! Each child grows differently so it’s hard to make any age recommendations. You should remove it when your child is too big for it and no longer comfortable in it (and looks a bit squeezed). Wait until your baby fits in the car seat snuggly without the insert. 🙂 Usually insert is good up to 2-3 months, but it really depends on the child size. Can this be configured with the toddler seat on top facing you in pram/bassinet mode and the bottom toddler seat facing out? So that you can carry a younger baby facing you and an older/toddler baby facing away and looking forward as you push the stroller? This stroller – Evenflo Pivot Modular is only for one child. Xpand allows you to put the infant car seat on top to keep your newborn baby closer to you, and toddler seat at the bottom – facing in (if you want to recline it) or out. However, in contrast to the single Evenflo Pivot Modular, the Xpand stroller doesn’t offer bassinet mode. Xpand seat can be adjusted to accommodate a baby from around 3 months. For a newborn baby there is only one option – the infant car seat. Hi! Do you mean the weight of a stroller and car seat and car seat base? It’s about 38.5 lbs. When it’s packed in a box it’s about 43.5 lbs. I wonder if the stroller can be fold with the bassinet on. I been looking every rwview and nonone said about it. Hi. I was wondering if this specific model allows for an attachable stroller board for my preschooler? Thanks in advanced. Hi Amy! Unfortunately, you can’t attach a board to this stroller. Do you know if you can buy a bassinet mattress insert to use for the carriage/bassinet mode? I mean to cover up the buckle of the seat when in carriage mode. I just dont know if baby is comfortable being buckled up when laying flat in the bassinet. Most bassinet strollers don’t have a buckle in their bassinet. Would love to know your opinion about this. Hi Saskia! Standard bassinets, that are separate from the seat, usually don’t have harness. 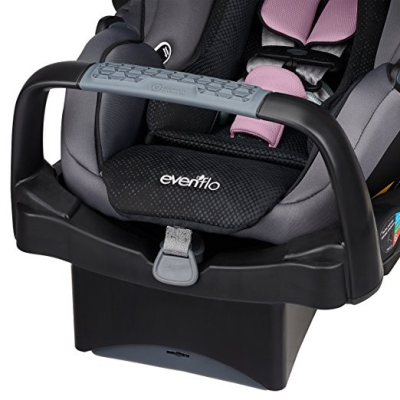 But if the seat is convertible, like on Evenflo Pivot, the harness stays on even in bassinet mode. If you want to use the harness for small baby in a bassinet mode, always keep an eye on your baby to make sure the baby is not slipping down). If you don’t want to use it, you can add a mattress, but Evenflo doesn’t have it in its offer. The seat is about 12″ wide, so you need to find mattress smaller than that. I think it won’t be a problem to find it for example on Amazon and it will be probably $15-$25. Hi, I have a 7 old week baby and I wish I would have known about this before I bought the stroller I have now. Do you know if the stroller is competable with other car seats so I can buy it and at less use the britex car seat on it? What stroller and car seat are you using right now? Maybe I could help you find a different stroller that suits your needs! I just bought this stroller from someone on Facebook , I’ve looked everywhere and I can not find out a way to take it apart to put the cloth parts in the wash!! Has anyone tried washing or know anyways to wash this stroller? Thank you! 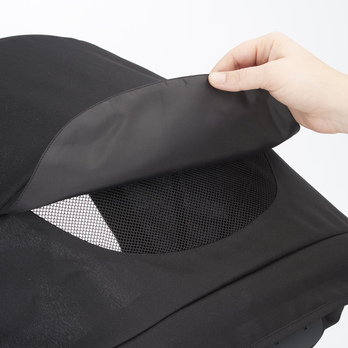 The fabric on Evenflo Pivot stroller isn’t removable for cleaning. You can clean spills and stains on cloth parts with cold water and mild soap and then air dry. Other parts (metal or plastic) you can wipe clean with a soft damp cloth and dry with a soft cloth. Remember not to use any abrasive cleaners or solvents. I’m 5 feet tall do you think the double stroller is short enough? It’s always so hard to find a short enough double stroller! 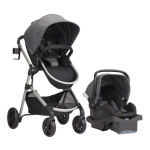 Baby Jogger City Mini GT and Mountain Buggy Duet are short parents friendly too. They also have adjustable handle with wide range of settings. Thank you for your detailed reviews on all these strollers, it definitely helps a lot especially for the new parents (like me lol) because I was overwhelmed by all kinds of brands and styles of strollers. 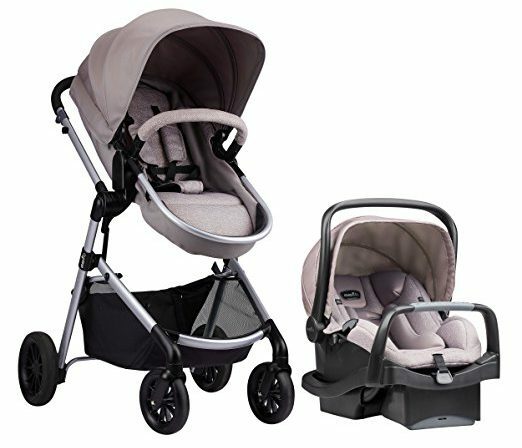 I now actually have an idea in mind that what type of strollers meet my need which is Evenflo Pivot Xpand, but I am wondering if I purchase the stroller from places like Target or Walmarts, would I still be able to have a technician to help us with the installation? Thank you! Hi Dorothy! I’m glad that my reviews have been helpful for you. Evenflo offers help with proper installation of the infant car seat – is that what you meant? If yes, it doesn’t matter if you purchase your stroller in Walmart, Target or Amazon 🙂 You can schedule your video support here: https://evenflo.appointlet.com/. I purchased this stroller and I love it!!!! its easy to put in and out of car and I love that you can easily take off the wheals. I don’t have much room in my trunk so that is very convenient for me. only thing I don’t like is that it doesn’t have a place to hold items like the graco strollers. the cup holder moves around too much, and I am not sure if that’s how all the car seats are or mine is loose but the handle is really wobbly. I will go check out the target one this afternoon. 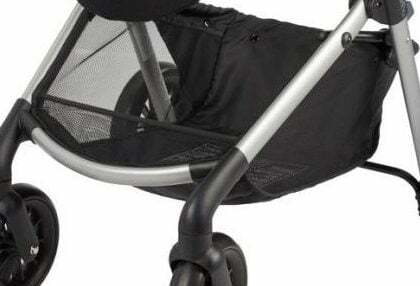 Do you know if the bassinet while hooked into the stroller is safe for overnight sleep? Considering buying a bassinet, but just thought to myself I wonder if we can use what we already have (we bought the stroller, but baby girl is due in June). I’ve researched, but you seem to have the most detailed review so far. Thanks for your help! Hi Jamie! I don’t think it’s suitable for overnight sleeping, there are no information if the bassinet was tested for that 🙁 You can use it for naps during the day when you can check on your baby. Actually I don’t recommend using any bassinet attached to the stroller for overnight sleep 🙂 Only few bassinets were tested and approved for that, for example: UPPAbaby bassinet and Peg Perego bassinet Pop-Up, but only with bassinet stand. I have researched this stroller for a while (before I knew I was pregnant lol) and it was actually the very first purchase made for the baby. I knew right away I wanted this stroller and I was only 8 weeks pregnant when we got it! Anywho, my baby isn’t due until early Aug. but I have set it up and played with it a little to see how it works ( i love it). Since then I’ve put plastic bags over all the parts and back into the box to it doesn’t get dusty or dirty for the next 9 months (now only 5) . Can’t wait to use it for my son! I bought the stroller from wallmart ontario for my baby, he is still 7 months but the wheels are so difficult to move and I really regret buying it, it is not cheap. I don’t like it at all. Have you contacted the seller or the manufacturer? I’m aware the wheels are not perfect and not suitable for tough terrain or bumps, but they should work on flat ground. On what terrain have you tried them? Maybe you received the stroller with defective wheels?